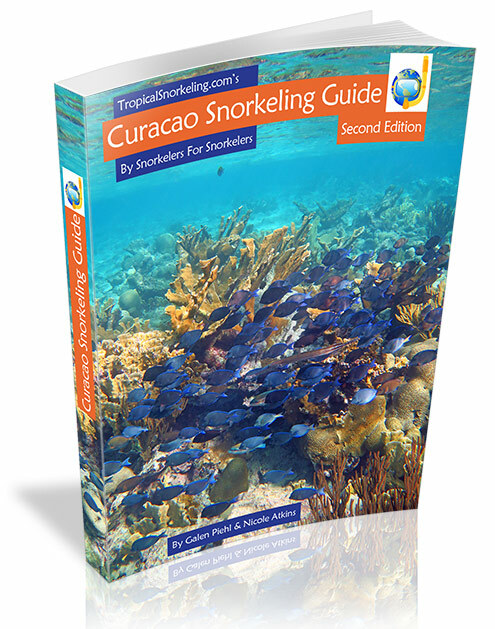 Our Curacao Snorkeling Guide eBook is essential for a great snorkel trip. Because when we were trying to figure out where to snorkel nothing on the web or talking to dive shops really helped. 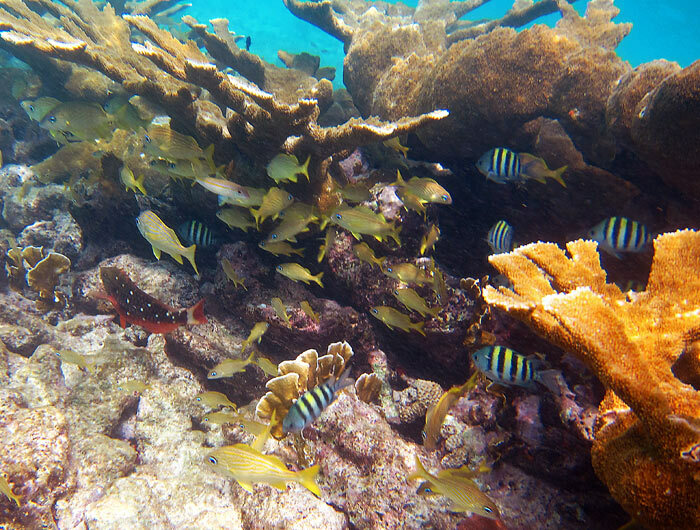 We had to snorkel an overwhelming number of locations to find the best ones. The short and sweet of this review, is that this guidebook was fantastic and we followed it to a tee! We actually printed a hardcopy version of it so we could bring it along with us wherever we went, which was very useful. We would get to a location, grab the guidebook, and scout out the area before ever getting into the water. 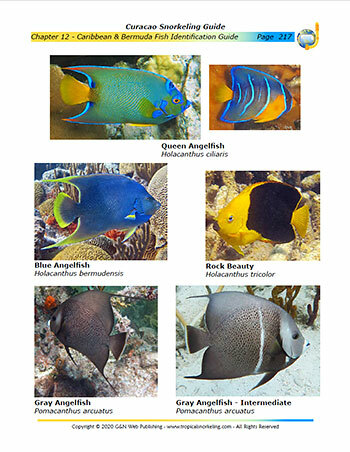 All in all, your guidebook is a must have for anyone interested in snorkeling Curacao. It was such a great help in all the planning we did. 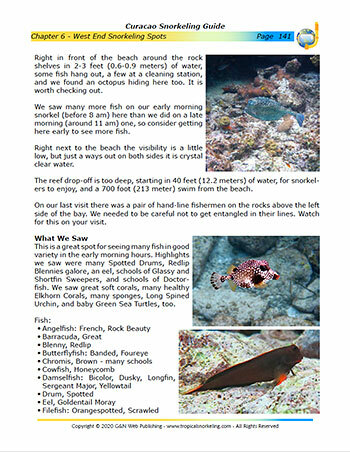 In planning future snorkeling trips, we will be 100% sure to see if you offer a guidebook for the location! This guidebook made my first snorkeling experience one I will never forget, and we both are so thankful to have found it! My wife and I snorkel, which is why I bought your guide. 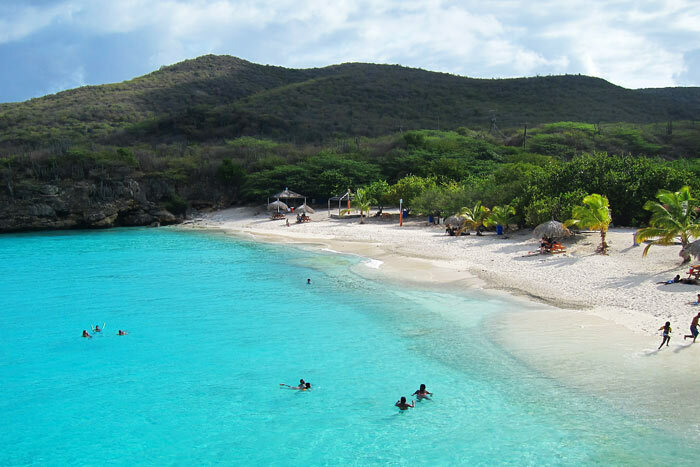 We actually live in New Jersey, but visit Curacao every year. I'm a TripAdvisor "Destination Expert" for Curacao, so I'm sure I'll be asked about your guide. I think you did a wonderful job with it, and there should certainly be a market, because very little else is available. 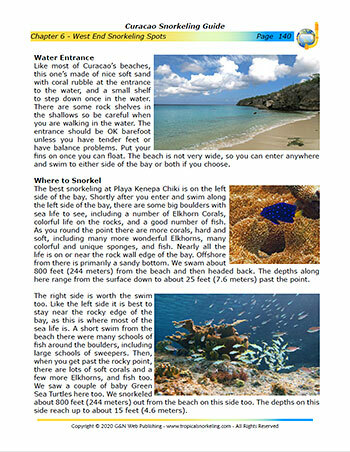 You guys did a great job in writing this snorkeling guide. 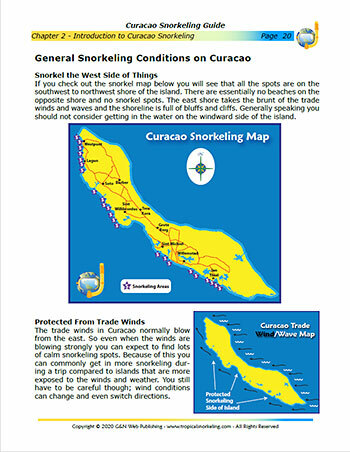 It is very informative and it will help us to have a much better snorkeling experience on Curacao. Keep up the good work. We will definitely purchase your other guides when the time comes. Thanks again. 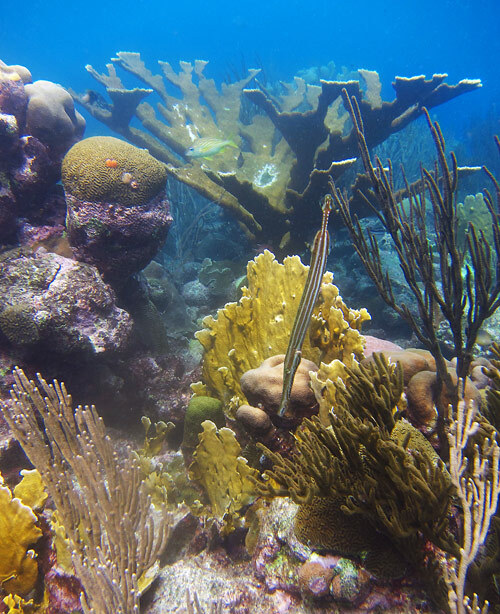 Wouldn't you love to see this amazing spot full of corals? And snorkel with all these fish and huge Elkhorn Coral and Pillar Coral? We spent two weeks snorkeling Curacao before Galen & Nicole's guide was published, and could only find limited information on snorkeling during our planning and visit. We selected Westpunt as our base... The guide is correct, the beaches in the area were spectacular and often astonishingly empty. But reading the guide, it is doubly-obvious that we need to return and snorkel in the many enticing, but more southerly areas described. 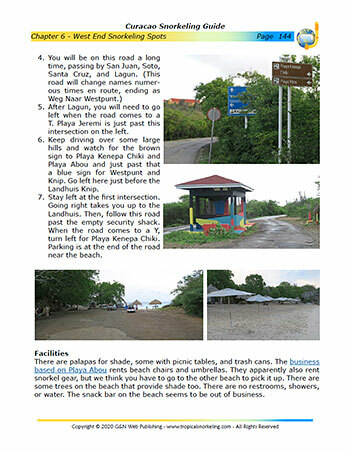 To anyone contemplating a visit to lovely Curacao, my recommendation is to take the guide's brief recommendations on practical details for a stay on the island seriously. 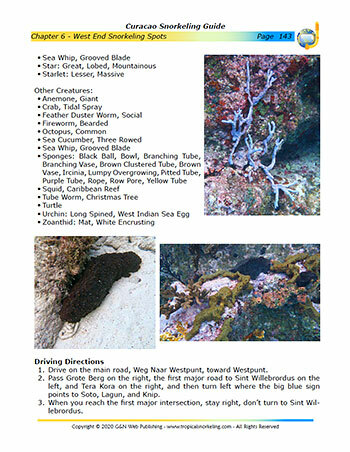 What's In The Curacao Snorkeling Book? 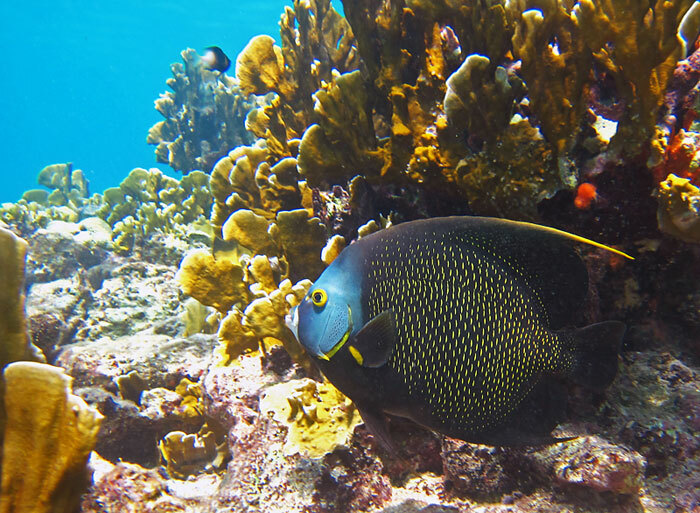 While snorkeling Curacao we were surprised that some of the very best spots, with lots of fish and fantastic reefs, were not where we thought they would be, and were hard to find (Curacao has a serious lack of street signs). And some of the most beautiful and popular west end beaches that we had heard were excellent, turned out to be mediocre. 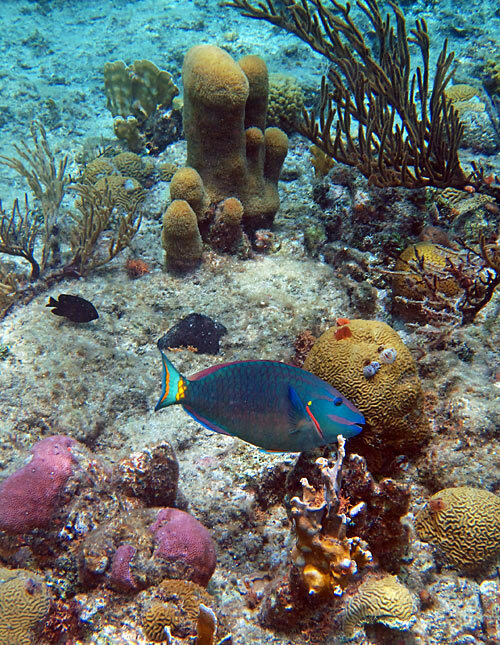 They had few fish and a lack of healthy reefs because of recent storm damage. 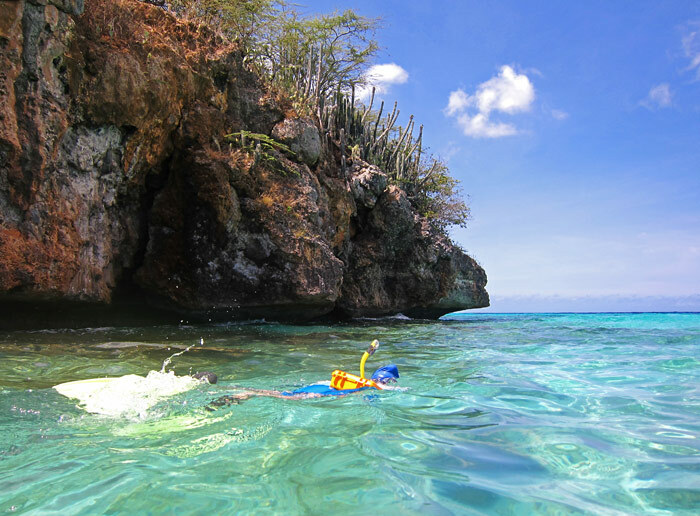 Although, even at some of these, we discovered areas worth exploring that most snorkelers seem to miss. 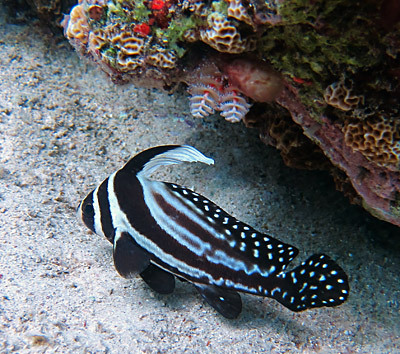 This guide will help you have the very best snorkeling trip on Curacao you can. 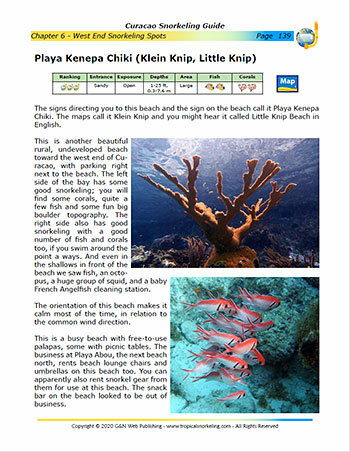 Any time we hear of changes on Curacao or when we find errors or bad links we update the guide. Printed guides are not updated until they sell all the printed copies. 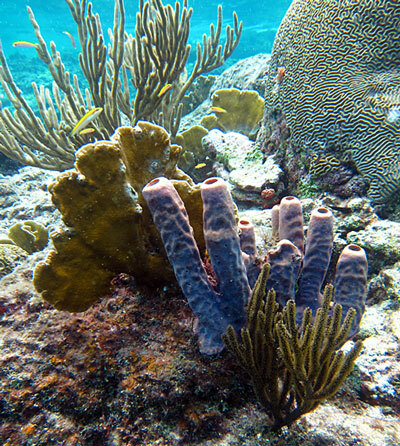 The vast majority of the best snorkeling spots on Curacao are accessible from shore. That means you don't have to go on crowded boat tours on their schedule, to spots you can't control, no matter the weather. 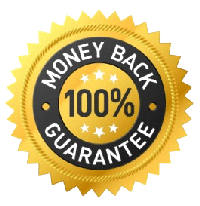 Your snorkeling will be better and you will save money in the process. Where it makes sense, like out to Klein Curacao, we do suggest some boat tours. We were able to find several snorkeling spots because of the directions that you provided in the snorkeling guide - otherwise we may not have been able to find them! !